Me: "JSL what’s wrong? Does something hurt?" He crashed his head into the pillow and laughed. Of course, I wonder how a 2 1/2 year old knows what a headache is. So I try to figure out a little more. JSL: "Yup and my belly!" Insert toddler laughter as he rolls all around the bed. I called in TechyDad to tell him what was going on. We both figured it was a stall tactic. This morning, the little guy was restless in his crib. We pulled him into bed with us. He kept yelling "Owie" over and over again. I asked what was wrong. Once again, he said his belly hurt. I asked if he was hungry and wanted to nurse and he said yes. Minutes after this, JSL proclaimed he was "all better, tummy no hurt!" He jumped off the bed and ran to see NHL in the other room. The boys started to argue over something. The next thing I heard was JSL tossing his cookies and TechyDad calling for me. The poor little guy was raced to the bathroom where he was retching. You could actually see the waves of nausea moving across his stomach. I assessed the situation and cleaned up the dining room floor. Meanwhile, the house started to shake as JSL let out a giant sized belch. This sucker was as loud as some of the hockey players I had heard at bars when in college. His reaction . . . he jumped and proceeded to cry in JL’s arms. Two additional episodes followed within a two hour span. The last was about 20 minutes after we gave him Tylenol. 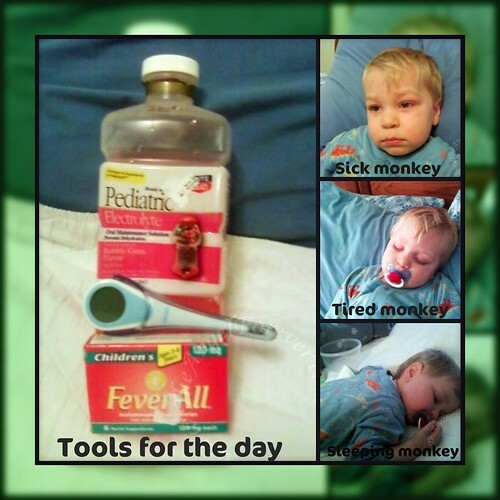 Thanks to his low grade temperature, and tendency to spike high and have febrile seizures, I called the doctor. I wanted to know what to do give him to avoid fever and dehydration. She called back after church and told me to get Tylenol suppositories. She said keeping his temperature down was more crucial at this point since he would not dehydrate that quickly. Of course, I could not find our box of FeverAll and had to head out to the store. At my second pharmacy, I was able to find some along with bubble gum flavored electrolyte drink. At 11:00, I used one of the FeverAll’s and within an hour he was asking for crackers. We gave him a few to start. The little guy barked for more. He had more and some water. An hour or so went by and everything stayed down. At lunch time, he has some plain pasta and a full sippy cup of the bubble gum electrolyte drink (typically he refuses these). At this point, we could see he was exhausted. I shuttled him into my bed and he fell asleep while we watched Paula Deen on Food Network. Tonight, he was upset at dinner. He wanted couscous, but we had none made and were not planning on any. Crackers kept him quiet and so far his tummy has stayed settled. Now we are just monitoring his temperature since his cheeks are bright red and his temperature is still elevated for JSL. Lesson learned, even a two year old knows when they are not feeling well. We will never doubt him again and will quickly move him to the bathroom. Now we are just going to sit back and see if anyone else in the family gets this bug….I have a feeling it may be me. Oy! .-= sheila´s last blog ..Fun Gift #1. =-. .-= RobMonroe´s last blog ..Wordless Wednesday: Snow Day! =-. Aw, glad he’s on the mend. I hope the rest of you avoid the icks!